Each fall, the RLA CE Committee brings in a special guest to help us kick-off the year of continuing education programs for Chicago-area library workers. 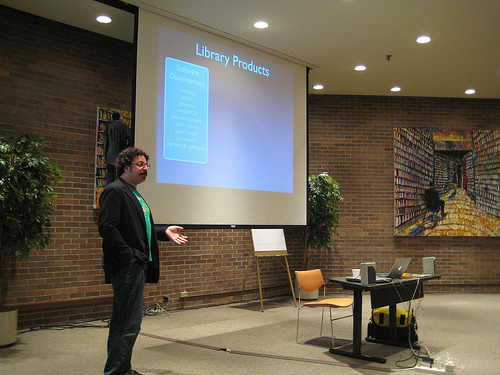 This year, Eli Neiburger, Associate Director for IT and Production at Ann Arbor District Library (MI), presented a thought-provoking and entertaining presentation titled, “The Producers in the Library: Production at AADL” (pdf). Eli made a very convincing argument that public libraries need to start thinking about and investing in their products rather than just their traditional services. He showed us some impressive examples of products created by his staff at AADL, including various websites, software, platforms, and events. He also talked about the organizational structure adopted at AADL that enables both products and services to flourish. To learn more, take a look at Eli’s presentation slides (pdf) and the Ann Arbor District Library website.